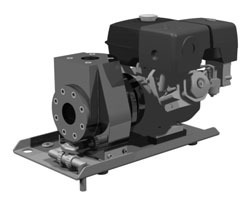 These pumps were developed to take maximum advantage from the key features of a group of synthetic thermosetting resins. The resins used are characterised by excellent resistance to chemical attack, strength and hardness comparable with many metals, and a good resistance to abrasion from fluid borne abrasives. A range of resins is used to gain optimum chemical resistance to the many fluids and chemicals encountered in industry. 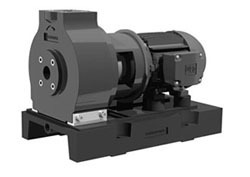 The CorroPump® product provides then a cost-effective alternative for many processes which would normally require the use of exotic metal alloy or plastic lined pumps. Equally, other more innocuous but nonetheless troublesome fluids such as chlorinated water and seawater are handled with ease and with useful economy. For many operators the use of any but this traditional layout is not an option. The ability to separate the hydraulic and prime mover elements provides tempting convenience and economy for many large sites. Corro®Pump assist the cause of those choosing to hold with tradition by providing power-end and base plate in the same corrosion resistant resins as the wet-end. 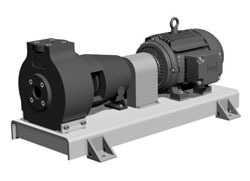 Even in the 21st century belt driven pumps carry advantages for some, with more accurate tailoring of curves to duties and the option of readily revising curves for those changing or indeterminate duties that make final decisions so difficult. Advantage is also to be derived fro the safety from flooding that an overmounted belt drive can provide in bund installations. The Corro®Pump road tanker pump provides the chemical transport industry with a pump package that will handle almost any chemical they need to move. Driven by either a premium brand 13hp petrol engine or a hydraulic motor and PTO package, this pump represents the most cost effective and reliable solution to an extremely difficult duty. 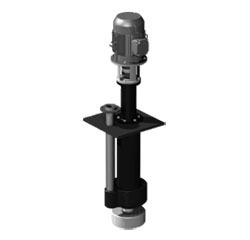 The VS series vertical spindle pump has a specialised role in chemical pumping. 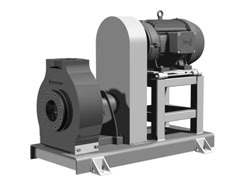 Because this pump operates with its volute and impeller immersed directly in the supply or process tank it is often the most convenient method of achieving NPSHR in challenging applicaitons. The absence of a mechanical seal means that the VS will happily run without product, making it particularly convenient for those processes in which it is difficult to guarantee reliable process fluid supply. This feature can even be utilised to advantage in those circumstances where top access to a tank is not available, by side-mounted hard-piping of the pump to the tank at an appropriate level. This unit is, of course, produced with all wetted components in our thermosetting synthetic resin materials and is available in a useful range of sizes.